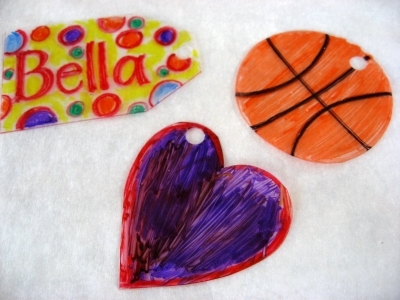 Home » Make » Kid's Activities » How to make Shrinky Dinks, everything you need to know! How to make Shrinky Dinks, everything you need to know! 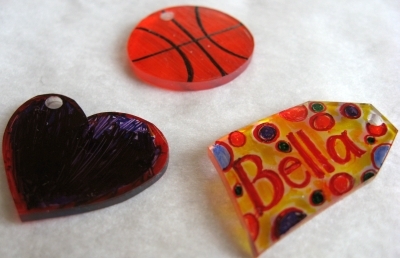 Have you ever wondered how to make Shrinky Dinks? You know, shrinky dinks, the thin plastic that shrinks in the oven. To make DIY shrinky dinks you need to save your #6 plastic containers (like the clear containers from the salad bar). Save the whole container, even the textured sides, and bottoms. It all works and flattens out nicely. The ridges on the sides give a nice space to color! We burned up most of the afternoon making DIY shrink plastic and used every bit of my large stash of #6 containers and were left wanting more! When your plastic runs out you might be interested in this huge list of kids crafts and activities, this summer bucket list and these free coloring pages. So many ideas to keep kids busy and engaged! What is a Shrinky Dink? 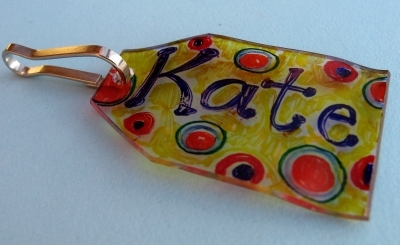 Shrinky Dinks are children’s activity that was hugely popular in the 80’s. Special plastic sheets when heated in an oven, shrink to small hard pieces without altering their color or shape. How do you make Shrinky Dinks? You can purchase the special plastic sheets (affiliate link) and follow manufacturer instructions. 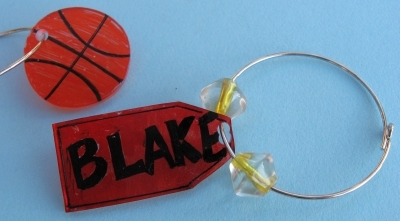 Typically, shrinky dink plastic if first colored on with permanent markers or colored pencils. Next cut out the shapes and bake at 325 degrees Fahrenheit for about 1-3 minutes. At first, the Shrinky Dinks will curl up, but then they will flatten back out. Once they flatten back out, bake for 30 more seconds. Here is the shrinky dink instruction you need! Cut a shape out of the plastic (plastic shrinks about 1/3 of the original size). Our 2″ circle became about 3/4″ when shrunk. Color one side of the shape with a permanent marker. The color becomes more intense once it shrinks. If you are wanting to attach your shape to something don’t forget to punch a hole before placing in the oven. Place the plastic on a thin cookie sheet (not the insulated type) covered with parchment paper or aluminum foil. Bake plastic at 350 degrees for 2- 3 minutes. Each oven is different so watch closely. You will see the plastic curl up and then it will flatten back out. It does give off some fumes so we left a window open for ventilation! We added a jump ring to some of our shapes and strung on cording along with beads to make necklaces. Some of the small shapes we placed on id wire rings along with some beads to make beverage markers. 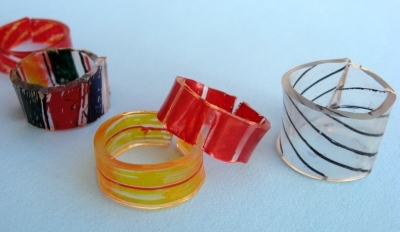 How do you make a shrinky dink ring? Then we really got rolling and made rings. Our shrinky dink rings are a bit sloppy but we are still wearing them. It took some trial and error to find the right size. For my size, I started with a strip 5″ long by about 1″ to 1 1/2″ wide. Pull it immediately from the oven and quickly while it is still very hot wrap it around a Chap-stick tube. My son needed to make his 5 1/2 inches long and I (an adult must do this part–it is hot and you must work fast!) wrapped it around a child’s chunky marker. If you make a mistake and get a miss-shaped ring or it is too long just send it back into the oven. Once it is warm it can be trimmed with scissors, it will also flatten back out and you can give it another go. For more information on making shrinky dink rings you will want to visit Planet June. Here rings are lovely! After we had used every piece of plastic my son said ———bracelets! We could make bracelets. So we are now saving more plastic! I was able to use a regular ink pad and stamp designs on the plain plastic with great results! #6 – PS: polystyrene is used in takeout food containers. It has been found to leach styrene–a neurotoxin and possible human carcinogen–and has been banned in cities like Portland, Ore. and San Francisco. Okay, so there is a downside to the craft! Using a toaster oven outside might be the best thing to do! I remember my grandmother melting white Styrofoam cups in the oven enough to make them look like hats. I think she did something for Mother’s Day with them! I did think the melting plastic left a lingering odor in my oven. Before using my oven for food I turned it on to 400 degrees and let it bake for about 20 minutes to get rid of the smell. Again, a small toaster oven reserved for craft projects and used in a well-ventilated area (like outside) is the safest way to make homemade shrinky dinks! What do you use to color on Shrinky Drink Plastic? To color the recycled plastic, it is best to use sharpie permanent markers. The colors darken as the plastic shrinks. Colored pencils work great on store bought sheets. The commercial sheets have a rough surface. Clear smooth sheets or the recycled #6 plastic will need to be sanded lightly in order for the color stick onto the plastic. Thank you for the heads up about sanding shiney surfaces before colouring! I’m new to this. A few questions. Oven door open or closed? Bake paint side up? Will #1 plastic work? Thanks for your time. Will using a printed photo I had printed at the store be okay for the shrinky dinks as far as the oven and the colors go? Or do you have to use a printer? Tori, I think as long as it is printed on the shrinky dink plastic it should work. My daughter does collage work. is there a way to take a photo of her work, transfer it to the shrink material so that could be used for a charm bracelet of her work? Is that even possible? Rhonda, yes you can do this. They make shrinky dink sheets that you can run through your printer. Give that a try. Sounds like a wonderful idea! I’m trying to attach a metal pin back to some beautifully butterflies I made with Shrinky Dink Ink Jet Computer film and glossed with nail polish. I have tried super glue and a glue gun, but neither work the pin back comes off in a short period of time. Does anyone have any advice for attaching metal Cindy to Shrinky Dinks without making a hole in them? Christine, have you tried an epoxy glue. You might have good luck with that. I think a popular brand is called E600. I didn't know about the #6 plastic but have been making shrinky dink charms, and found that putting parchment paper on the bottom and on top made all the difference in how each charm came out perfectly flat. Everyone please research the dangers of heating #6 plastic! Everything I've read and seen on the subject recommends avoiding; normally in bold red lettering. Most recycling plants won't take it and there are recycle bands on it in some states. Don't just take my word for it, contact your local recycling center or search it online. I tried these this morning, hoping to make charms for my daughter's upcoming birthday party. The first try, they rolled into tubes, but did not shrink. The second try, it maybe shrunk a millimeter. Like a previous commenter, I have no idea how people are making this work. I am using the right type of plastic, but no dice. Suggestions, please? Chelsea, Leanne has a great reply.... for me too I found if they are in there long enough they will uncurl. I can not wait to do these because they look so cool when they come out of the oven. Every time my daughter and I make these they just roll into tubes and then my daughter cries like a banshee because I destroyed her art. I'm using #6 plastic so I have no idea how everyone else is able to do this and I keep ending up with what looks like a crack pipe. I've since tried making a bunch of these on my own and they always end up the same way. Jennifer, they will curl up but usually flatten out themselves with a little longer in the oven. If they don't go flat on their own use tongs or whatever is handy when they are still hot to flatten. I have used a metal spatula to press them flat. Thanks Leanne for helping. I too have found you need to leave them in until they uncurl. I am using these as name tags on student vocabulary card rings. Also - just wondering (and maybe someone else mentioned it already - but I'm wondering what would happen if we were to "rough up" one side of the plastic using Brillo pads or a wire-brush or something similar to get that frosted glass look. One other thought - I learned about the #6 plastic trick looking for a way to make tags for our dog and cats. Those things are so expensive at Pet Smart and this is not only free, but I a lot more personalized and probably easier for an animal to wear (lighter, less constant jingling . . .). I would suggest using colored pencils, the coloring does not requires full coverage small spaces in the pencil strokes disappear as the plastic shrinks. Markers are not recommended because they stay fluid when heated. Even non-toxic markers can become toxic when heated. This is extremely late but when we made these, the ink also came off ours, so what I did was coat them in a thin coat of clear nail polish. :) You could probably also use something like a spray fixative or finish! I used shrink film that Readymade Magazine sent me from their olnine shop. However, this post was written a long time ago and it appears that the shop no longer exists. Both the white and the clear were the same brand, but I don't remember what brand it was. Sorry! But all shrink film works the same way. Just make sure you buy film for an inkjet printer, if that's what you have. I have an older HP PSC 2210 all-in-one inkjet printer. I did notice that the printed colors looked a little more vibrant and intense after baking the film. But since I didn't care what color these pieces turned out to be, I did not adjust any colors before printing. Hope that helps you! What about those clear sheets of plastic they use on spiral bound reports as a cover sheet? Can't wait till Wed - recycling day - I'll be out going through the bins! Plastic number 6 is used for the lid off Sam's Club rotisserie chicken! Why don't you just buy shrinky dink sheets? They have a web site and you can get them in most craft stores. You get lots of nice large flat sheets, they shrink proportionately and you avoid the dangerous fumes. I would LOVE to do this with my kids, but I cannot find PS-6 *anywhere*. Do you know of any other plastics that might work? I'm beginning to think maybe my area doesn't allow PS-6 for the carcinogen reasons. actually do have a couple of questions for you if it's okay. Could it be just me or do a few of these responses appear like coming from brain dead people? Good blog you've got here.. It's difficult to find high quality writing like yours these days. roommate! He always kept preaching about this. I'll forward this information to him. just gotta find where i stashed it when i moved! Will old x-rays be suitable to shrink??? I don't know Wendy. It might be worth a try. looks fine however, if opening in Internet Explorer, it's got some overlapping issues. inhaled. Damp mopping is OK as long as the mop is only slightly damp. your car seat and others are made to help you polish your hardwood floors. Combine bread crumbs annd parmesan cheese in a shallow dish. gravy. Most of these breads are primarily made wiith enriched flour. Can I use the microwave instead of the oven? I have had that happen too. What I found is that it will be misshapen if you use the sides, even if they are flat. My guess is it is because that part was stretched out differently to conform to the container shape. If you use the flat parts at the top or bottom of your container, I think you will get better results. I did 2 separate tests of circle shaped one in the #6 plastic. they turned into ovals and stretched out! um how can I stop that? Should I put them in less time? Can I use a Heatgun as a substitute for oven? Thank you so very much for this info. I made shrinky dinks (store bought) when I was a kid and wanted to do some with my kids but never could find any in the store and the shrinky dinks website was too expensive and didn't have the designs we wanted to make. I'm gonna try this and will send you our results. Thanks again. Oh, can we post our shrinky dink pix results on here?? To Chloe, when you pull them from the oven lay them on a flat counter and put a heavy book on top while they are still warm. They will flatten and cool in about a minute. Mine didn't flatten back out again. What did I do wrong? I used clear #6, put it in a metal baking tray (it's quite deep, it that a problem?) covered in tin foil and baked it at 180C for 3 minutes. Does it always flatten out again? michelle, it is 325Fº bake till golden brown LOL no, really bake for 1-5 minutes! The baking in the oven part, I assume its 300F? not C? Not sure what I am doing wrong. My daughters and I tried this a couple years ago and decided to try it again today and the same thing happened both times: the plastic never flattens back out (after it begins to warp while shrinking in the oven), so they come out shaped as domes, the corners folded in on itself, or looking like a hill country. I am wondering if we are cutting our plastic too large. The pieces were going to be name tags for their lunch boxes and backpacks, so the pre-shrunk size of plastic was probably around 4x7. Anyone know if the plastic needs to be cut smaller???? Hi I tried this, but mine didn't flatten out, they just curled. The more circular ones also became oblong, like a long thin oval. Any suggestions? Ok, I love the idea, but mine are melting really wierd. The proportions are really strange. My circles are turning into ovals! Please help!!! When I was younger we used to put crisp packets in the oven and watch them shrink to about 1/8th of their original size. I was fascinated. Then 'proper' shrinkies came out but that took the fun out of it. I will definitely give this a try with my boy, would be great to make Xmas decorations. I tried SEVERAL times today to make things (even a simple circle) and every single time the plastic would curl or become horribly misshapen. I tried raising the temp, lowering the temp leaving it in longer ( even up to 10 minutes one time) and not one item turned out even remotely close to the original shape. What am i doing wrong? I made sure I got #6 plastic, I used parchment paper on the cookie sheet. I don't know what went wrong. Anyone else have these problems? Any solutions?? I have used sharpie markers, and they did not rub off with normal use. I had a leftover salad container and wanted to try this, but I looked on the bottom and it was #1, not #6. I did it anyway just for kicks, and it did not work. The plastic bent and curled, and turned opaque white. Thought others might be curious too and could learn from my experiment! Thanks for answering my question about using #1 plastic. I will just throw out what I saved. Too bad. Thank you, I have just been looking for information about this subject for ages and yours is the greatest I've discovered till now. But, what in regards to the bottom line? Are you positive in regards to the source? So if this type of plastic is known for leaching styrene...does anyone not worry about that fact that usually happens when polysterene (aka plastic #6) is heated. If you are putting this plastic in the oven, etc., are you not creating the perfect environment to contaminate your home with these scary chemicals? It sounds like a cool idea...just worried about the chemical reaction that is actually taking place here. I just tried this with some #6 plastic cups I had left over from a birthday party. They make cute little circles. 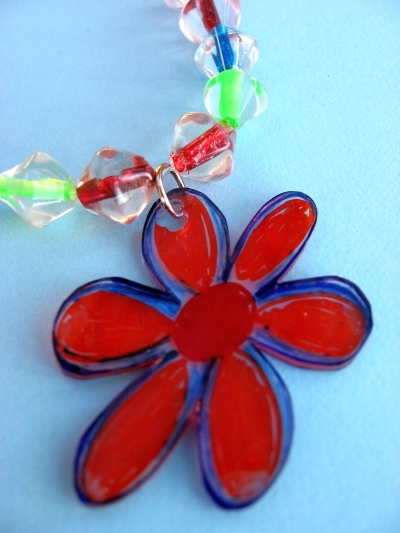 I am going to have my preschoolers decorate them to make "stained glass" window charms for Mother's Day. Yippee!! Want to avoid the fumes? Hot water will shrink this plastic. I discovered this when I reused a salad container to hand wash some clothes. The large container shrank to a flat surface. An idea might be to put it in a freezer zip lock, squish the air out then hold it under some hot water with a spoon. Can't wait to try this. Have been saving containers too. Though am a little apprehensive about using the baking oven....i think i'll still have to try this. One question: Can i place something between 2sheets and try and fuse them when i bake? Anybody tried? @Amy--If yours curled up, you took them out about 2 minutes too early--if you didn't throw them out yet, put them back in the preheated oven and they will finish up just fine! I just linked you, love your ideas! Hmmm…very excellent to discover out, there were without a doubt various points that I had not concept of before. We use colored pencils, they dry hard and do not rub off!! OK, I am totally hooked! Making pendants, earrings, bracelets, etc. On top of the world yesterday with this new craft. UNTIL....du-du-u-duuuuuuhhhhhh, I wore my FAVORITE pendant and found that towards the end of the evening the ink had rubbed off. I was touching it, as I am a figeter, and much of the ink had rubbed off. Too bad, so sad. Now I am trying to perfect this craft. Any ideas how I can make the ink permanent. Truly permanent? I was thinking a coat of clear nailpolish would do the trick, but it too removes the ink. Ideas???Ideas??? I found an old toaster oven at a yard sale...works great...sold because it was ugly...it is now my designated craft oven. Shrinky dink, polymer clay, all works great and you can watch it at eye level. We used most of the bottom of a square salad-sized container for a luggage tag. Ours shrank to more like 1/4 of the original size. We left 1/3 inch or so of ridges all the way around, which was a great effect. The square shape gives a really funky look for a luggage tag, and the addition of a little ball chain makes it seem legit somehow. :) Re. the fumes, I moved a toaster oven to a screened room when hosting a playgroup party at which the kids made charms and pendants with #6 plastic. traciesadie: try yoghurt cups if available; they are usually made from polystyrene. You can also use styrofoam trays (they are #6 too) for a different effect). Also clear lids from takeout are usually 6. Hope this helps. i'm having trouble finding plastic #6 i live in holland-all my salad containers,bakery boxs,cheese packages etc are all #1. Can you help? wow i was going to buy my sis a shrinky dink set but now we will just make them! WOW!!!!!! I am sooooooo excited! I have been searching all over town for plain shrinky dinks sheets for my sons to make into christmas ornaments for gifts to NO avail. So tonight I am on my trusty Mac doing some research to locate them and lo and BEHOLD! I have found this site. Thank you. I cannot wait to try this with my kids tomorrow!!!!! I love the way you write. "Ours are a bit sloppy but we are still wearing them." So cute. I have to read this blog more. I just did this craft with my kids. They loved it. One tip- we wanted to use colored pencils so I took some sandpaper to the plastic first and then we colored it. Worked like a charm! I've been a fan of your blog for some time now. I love all of your ideas. You are awesome. I finally got around to trying this one out. My son loved it. And I did not experience any fumes in my house. I will be trying this again. Thanks for the instructions. Well, I thought we werent supposed to use the number six, but after further research that the one we are supposed to use, but carefully I guess. Sorry. I've been itchin' to try this you originally posted this, but I couldn't entice my daughter. Today she agreed we could make "jewels" for the cookie tub she rescued from pre-school to become a treasure box. Yippee! She had lots of fun and made a bunch of cute charms. (We did fail with acrylic paints. Apparently it's too dense and the plastic doesn't shrink well.) THANKS!!! great idea, I love shrinky dinks when I was a kid. I will be linking to you! Love this idea. Thanks for sharing!!! Seriously, contagious! how did you actually cut the #6 plastic? Has anyone tried to fuse two pieces together with something encased between the two layers? I thought of small metal charms or someother color plastic...? One other tip I forgot to leave in my earlier post. Be sure to seal the artwork side as those finished items scratched quickly to my 5 yos shagrin (mine too). Triple Thick gloss glaze by DecoArt from Michaels worked great as it left a thick coating in one coat and left NO brush marks. I've always wanted to try this diamond glaze and here was my chance. I'm sold. THe link for the rings is now working. I was able to click and see it. I saved it to my harddrive incase it ever disappears again. :) Thank you SO MUCH for your tutorial on this!!! Recycling Class 6 plastic is polystyrene. You can buy clear or colored sheets in hobby shops or plastics dealers. You can also do this with styrofoam which is expanded polystyrene. You can use the white meat trays, styrofoam cups and plates or sheet styrofoam from a craft store or home depot. I experimented today with #6 plastic. The plastic I used came from packages of fresh berries (I knew I was hanging onto these containers for something). Make sure plastic is clean and free of water spots as these show up in the finished product. I attempted to use an embossing gun as I've had success with regular shrinky dinks but I ended up with a curled up mess. Oven worked great. I added rub on transfers and used modgepodge as a sealer. I'm so excited! I came over from Kidz and just had to see this. I loved making these as a kid. Awesome! I can't wait to try that! Is there any other plastic that will work? I have a lot of #1 and #7? My 3 year old is excited to try this project, but am having a hard time finding the right type of plastic. Can't wait to endanger my kids with styrene which is considered a possible human carcinogen by the International Agency for Research on Cancer, the World Health Organization's leading source for information about cancer. Added bonus, it may disrupt hormones. Your kids will love you for that! And, joy of joys, if you're planning on having another kid, it my adversely affect reproduction! Hi! I love your website and have been reading it for quite a while. I nominated it for an award. You can read about it here. this is a perfect sunday project with my kids !! thank you for sharing, can’t wait to try it !! Thank you so much for posting! I've been wanting to try this, but didn't know you could use the sides or what type of plastic. I've got a container here that my wrap came in for lunch that I will try this out with over the weekend. Here is the link to the ring tut from above- looks like it was trying to add this information to the end of your blog address & it was making it come up wrong. BTW- Been reading your blog for a couple of weeks now. Love it!! This is great - #6 is the one plastic we can't recycle in our area so I throw it away. New use! What a neat idea. Years and years ago, we used to do this with drink lids, then they changed the type of plastic and it didn't work any more. An old idea from Pack o Fun. I'm going to try working with the containers marked #6. Can you do this with a heat gun like regular shrinky dinks, or will it take too long? We used to use the Styrofoam cups to make mini flower pots. Color designs on them before you shrink them, then make shrinky flowers to go in them on pipe cleaner stems. They were party favors. Like others have mentioned, I also have a toaster oven dedicated to crafts. Mostly for Sculpey. And I use it outside. I have been waiting for this post !!!!!!!!!!! !Hip Hip hurray! oooohhh! what a fantastic idea! i am *so* trying this after i eat out next! Thanks so much for this!!!! Can't wait to do this with my girls. I LOVE the idea, and the saying, to use the zipper pulls for valentines :) So how many #6 containers would I need to make 32 tags/hearts? hmmm. Thanks again!! We use our toaster oven and put the item on a piece of brown paper bag. I haven't noticed a smell (maybe the odor of burned crumbs on the bottom covers it up?). @Diana: I read that about sandpaper, too. I tried it once - it's a royal pain, so I gave up. It might be easier with flat plastic (mine was shaped), or maybe I had the wrong grit of sandpaper. Whatever the reason, I gave up on that! @Jennifer: plastic containers that salad comes in, grocery store muffins, Trader Joe's Joe-Joe cookies, stuff like that. It's more brittle than a milk container, usually clear and see-through, and often shaped or textured. It is very very magical to watch shaped things (like the muffin cups, or the salad boxes) flatten out! Ok, you really must be the coolest mom ever. I will definitely be saving this! as for the smell and possible carcinogen- couldn't you do this as a summer time activity and do it in a toaster oven (one dedicated to crafting) and do it outside? just a thought! thanks for the tute- love it!!!! I will be linking to this! I love it! wonderful! can't wait to try it! OMG! I have to go check and see if we have any #6 plastic containers in the recycling bin! Awesome idea! I was just telling my students about shrinky-dinks the week before we went on winter vacation. This is a fabulous idea! I am sure I can make it into a math project. Cool Idea! I loved Shrinky Dinks when I was a kid. I've been hooked on your blog for the past couple months, you have the best ideas. Thank You for taking the time to do this! So fun!!!! I'm totally going to save these containers from now on! I can't wait to try it! Ooohhh! I feel a project coming on! Okay... this is the COOLEST thing EVER!! Yay! I can't wait to try it. Was it stinky in the oven? Did you open a window to vent fumes? I love how you recycled that plastic! cant wait to try it with my boys! Thanks for the great ideas. I can't wait to do this with my kids. I bet you could even get the grocery store to donate a couple of plastic containers every once in a while for school and church projects. We did Shrinkable plastic last year at VBS. I wish I would've known you could use the plastic containers. It would've saved a lot of money. Yes.. I too want to know to tell a difference in plastics! You could do SO many things with these. Thanks so much for sharing! What a fun idea. I will have to start saving my #6 plastics. I love your website. You have so many great ideas. Hello. I just came across your website and you have fantastic ideas! On the shrinky dink idea, I was wondering, what exactly is #6 plastic (like what items)? I am embarrassed to say that we don't recycle. Maybe this will be the kick start we need, that and we are saving the planet! I love your blog, what great ideas you have! I haven't tried recycling plastic like this yet but I have heard that you can rough up the surface with sandpaper and then use colored pencils to color the plastic as an alternative to using permanent markers. Maybe someone will try it out and see what the results are!